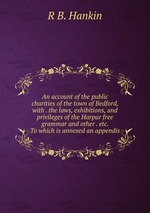 Аннотация к книге "An account of the public charities of the town of Bedford, with . the laws, exhibitions, and privileges of the Harpur free grammar and other . etc. To which is annexed an appendis"